Today, it rained. We knew it was coming so last night over dinner we tried to decide what to do that was dry. We started with the idea of going to Nerja to the caves, but we didn’t want to spend another day in the car going down crazy roads (see blog here about that). We planned on staying local, as we hadn’t really explored the town of Colmenar which we are just outside of. We thought we would get up, have breakfast out and the go to the honey museum. That way dad might get another magnet as well. We awoke to glorious sunshine pouring through the bedroom windows and I jumped out of bed (ok, crawled out) thinking perhaps the forecast had got it wrong. It hadn’t. It was just that for a few minutes we were actually above the cloud line. It wasn’t long before the clouds engulfed us as the rain continued. 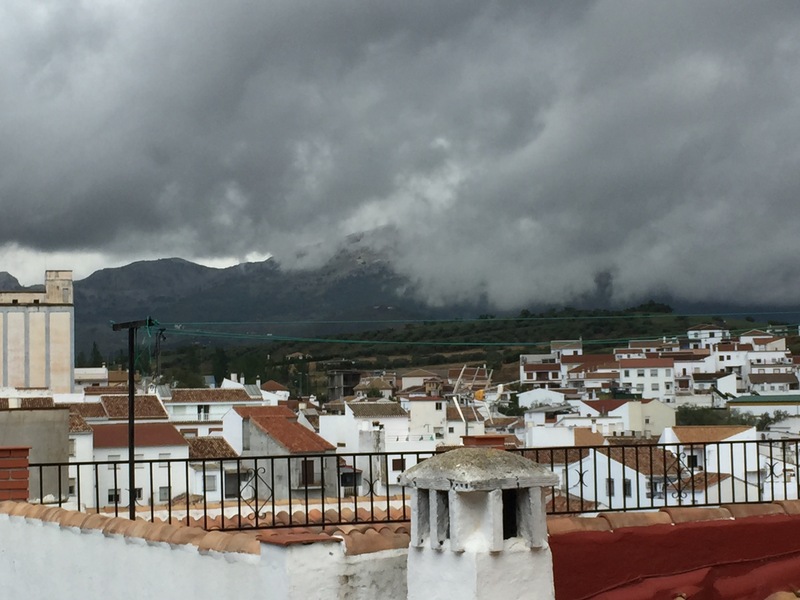 It’s funny how Spain in the rain looks remarkably like Wales. We all donned our cagoules (which is 1970’s for waterproof jackets) and boarded the car in the pouring rain like a military operation. We all started stood under the cover of the porch, Tibu remotely opened the car and Nikki and Rachel ran to the car and climbed into the back, back seats. Once she got the all clear that they were in and the seats back in position, Karen sprinted to the car and located herself in the middle back seat. Once securely belted in, mum and dad got into the car as quickly as they physically could, then finally myself and Tibu got in the front. All 7 of us in…relatively dry. Then Tibu realised that he had the wrong glasses and had to go back into the Villa, then I was sent 5 minutes later to tell him that they were by the hob, and then we all got back in the car, 5 of us still relatively dry. We had decided to go to a restaurant/hotel in the village called “Belen” (father, note the lack of a ‘d’ on the end). It had some relatively good reviews on TripAdvisor and at the end of the day, we only wanted breakfast. We pulled up, sent Tibu in to make sure that they did the tomatoey oily bread we had the other day. Well, he was already the wettest, and there was no point in us all getting out if we just had to get back in again. A few minutes later he gestured that they did, so we unpacked ourselves and headed in. Once inside it was massive. The dining room must have had at least 100 covers (that is restaurant talk for seats. We only speak restaurant when we are away with Tibu. Apparently in Carrefour he is our sommelier, not just a buyer of cheap wine). The thing is that looking at the size of the place, the hotel probably only had a dozen rooms at the most. That’s effectively a table per person. Rachel explained that it would be for weddings. All villages had one hotel with a big room for “a bit of a do”. There were 5 men sat the bar already having breakfast, so that was a good sign. 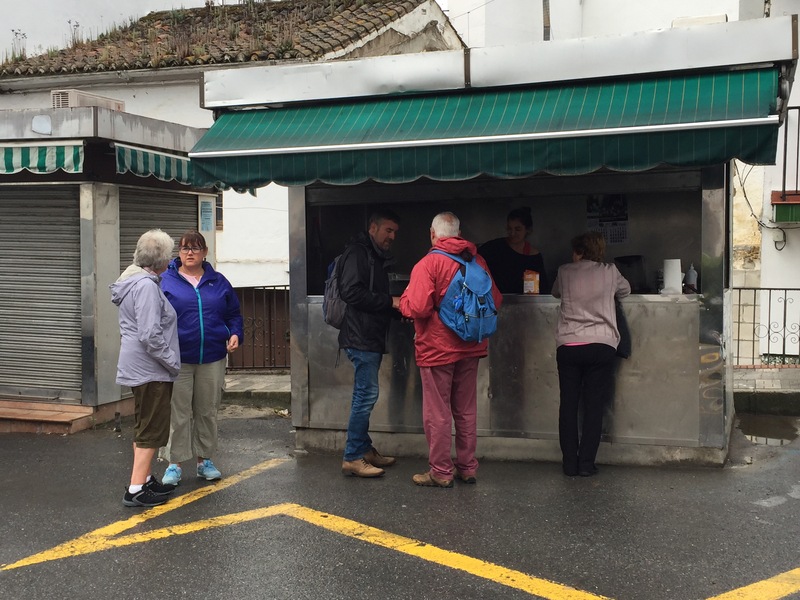 We had a really good oily bread breakfast (for less than €3)….but it was only 10:30 and it was still raining. The honey museum it was then. We left the car at Belen (as the the parking in Colmenar is terrible) and walked down to one of the town’s squares. We came across the churros stand. We had just finished breakfast 15 minutes earlier, but it seemed daft not to make the most of the opportunity as we knew she shut at 11:00. For those of you who don’t know what churros is, imagine doughnut mixture extruded into spirals and deep fried. You have about a 12 inch section covered in sugar and possibly with a chocolate dip (if you are lucky). It’s a traditional Spanish breakfast dish. I’ll tell you what, we may dis the Americans for having cake (i.e. Muffins) for breakfast but they have nothing on the Spanish. Tibu is consuming about 1000 calories every breakfast with his various pastries. So wanting to blend in in we stood in the square and consumed our churros. It was now 10:35. The next activity was the honey museum. Colmenar comes from the word colmena which, quite literally means “bee hive” – and I’m not using the word “literally” in the sense that the kids use it when they mean “figuratively”, I mean that it literally means “beehive”. I guess the way Ormskirk means “Orms Kirk” literally means “the church of Orm” and Blackpool literally means “I wouldn’t swim in that if I were you”. (I have just had a note from my lawyer and just to say Blackpool does in fact have an EU blue flag and it is safe to swim in the sea off the Golden Mile; but beware of the hen parties.) They are very proud of their honey here and so have a museum all about it. I suspect that it is like the lawnmower museum in Southport and claims to be “the only one in the world” or in other words “the only one that someone can be bothered to set up”; but it is quite sweet (no pun intended). Actually, I think I might set up a museum of little chairs made out of the cage that you get on the top of a bottle of Cava. I reckon there is an EU grant to be had there. Better get in quick. Anyway, back to the honey museum. If it you want to get a full feel for the opinion of the honey museum, visit TripAdvisor. I have included a link here. You get the full range from the ardent bee keeper to “really can’t be arsed”. We fell into the “it’s wet, it’s open and it’s only €2” category. You will also find that it is number 1 out of the 2 activities to do on TripAdvisor. The other was a church which was locked. I intend to launch a campaign to get the churros stand number 2, above the church. They have no idea of poop bins around here and the streets are a like a minefield of canine excrement. We had a coffee in a bar, repacked ourselves in the back of the people carrier and headed off to Carrefour, just in time for the sun to come out. Typical.